Can we get back to basics? When you walk in your local po ol or hot tub store does it look anything like this? 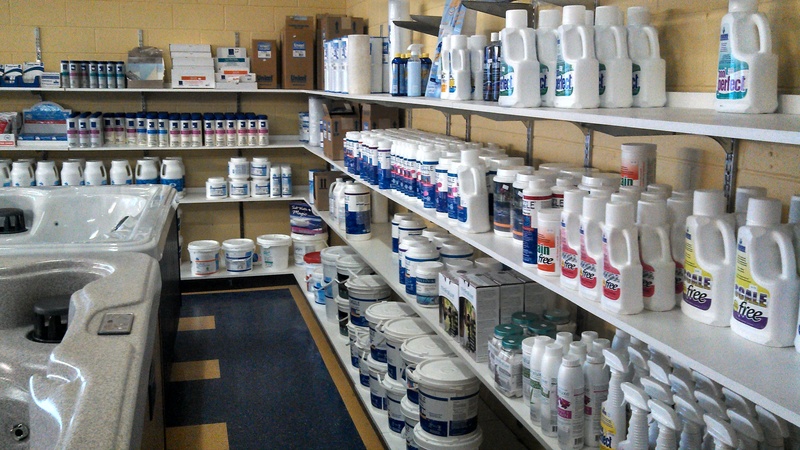 An intimidating wall of chemicals that leaves you wondering, “how much of this stuff do I REALLY need.” I don’t blame you. I really wish it wasn’t like this. I can assure you though, that you don’t NEED all of it. That’s it. Simple so far, right? Hope so. Under the Essentials category are all the products you NEED. Again, I have thought about how to keep this simple, so let’s see if we can make it as easy as ABC. That’s 4 products that you will use in amounts that will vary depending on your source water and how much water you are balancing. The only other products needed are a Sanitizer (bromine or chlorine) and an Oxidizer (aka shock). 6 Products. That’s it. That is all you NEED. Those 6 products alone are all you need to properly balance and sanitize the water. And balanced water is happy water. In the next article, I’ll explain what is involved in water balance and why it is worth every penny to do it properly. This entry was posted in Water Care and tagged health, Hot Tubs, pH, science, swimming pools, Victoria BC, water, water balance by Stephen O'Keefe. Bookmark the permalink.